Mass-ALA’s public policy initiatives focus on developing the assisted living workforce of the future, and promoting safety and quality of life for seniors, making assisted living affordable to more seniors, promoting common sense regulations that improve the lives of seniors without adding to the cost of residing in assisted living, to name a few of our priorities. However, the advocacy of the Mass-ALA staff can be most effective if leaders in assisted living work collaboratively with the association in advancing our agenda. You are in the best position to explain the importance of maintaining senior living options that promote choice, privacy, respect, and independence. Mass-ALA’s Advocate Program is for members who champion the principles of assisted living—choice, dignity, independence and quality of life—by encouraging advocacy year-round. Are you accountable, honorable, and altruistic? Do you take action to protect people? Do you want to make a difference? 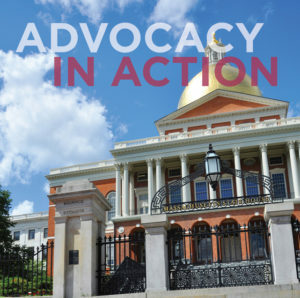 Raise awareness about assisted living among legislators and other policy makers—become a Mass-ALA Public Policy Advocate! Ideally, there should be at least one Mass-ALA Public Policy Advocate for each assisted living community. Members who earn the title of Advocate by completing five or more of the below criteria will be recognized for their extraordinary efforts on behalf of assisted living at the annual awards banquet and annual conference. By hosting a tour of your community for legislators and their staff, you provide them with an opportunity to gain personal, ﬁrsthand knowledge of assisted living, dispel myths and inform decision-making in a positive way while simultaneously providing your residents with a chance to let their voices be heard. Use Mass-ALA’s talking points to clarify the “asks” and messages, and then tell us about the visit by emailing pictures and filling out our legislative outreach survey. Not sure who your legislators are? Check this list of legislators by assisted living residence. Deliver the assisted living message to State House legislators so they understand how proposed issues and laws would impact your residents and business. Join colleagues at Mass-ALA’s fun and informational annual Advocacy Day and shape the future of assisted living. Strengthen your relationships with legislators and their staﬀ by attending or helping to coordinate one of their district “meet-and-greets,” community meetings or fund-raisers. You will get to know your legislator’s staﬀ, which can be just as important as knowing your legislator—and you don’t have to travel far! Participate in at least one Mass-ALA member forum or public hearing, Public Policy Committee or Regional Leadership Council meeting or other state discussion, forum or hearing on a bill, legislation or regulation. Our actions speak louder than words. Legislators care who is watching back home. Writing to your legislators definitely has an impact on proposed legislation and Mass-ALA’s successful advocacy. Send three or more letters or emails in 2015 to your state or federal delegation on an important legislative, regulatory or other advocacy issue. Remember to send us a copy as well. Your contribution is encouraged but not required for participation in Mass-ALA’s Advocacy Program.